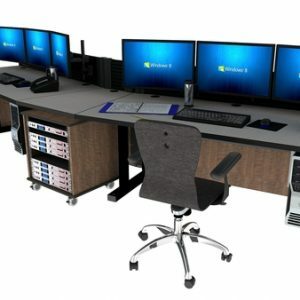 Command and control room console furniture engineered specifically for the 7×24 demands of critical monitoring solutions such as NOC, emergency dispatch, and process control. A rugged infrastructure coupled with quality exterior materials allows for longevity and durability despite constant use. The Command Watch line of consoles has a handsome, professional look while providing exceptional ergonomics for the operators. Command Watch NOC console furniture is a direct to consumer, commercial quality console product that is available in sit/stand or static positioning. Command Watch is an industry expert in the design, manufacturing, installation, and field integration of control consoles. 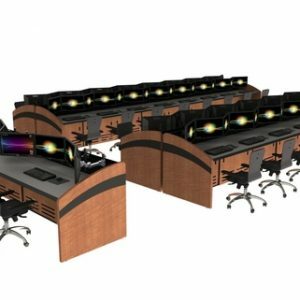 Our products and installations include command center furniture, control room consoles, and network operations center (NOC) furniture. The Command Watch and Command Flex lines are extremely functional and simplistic in design. Our quality components and state of the art console technology makes the Command Watch and Command Tech lines the most in-demand product in the command center and NOC space. The modular Command Watch console furniture desk system is designed around the rigorous demands of a 7×24 environment but not at the expense of style and aesthetics. The Command Watch is designed around flexibility. Numerous straight and corner module options allow for extreme configurability to optimize useable space within the room and maximize operator productivity. Command Flex is targeted to control rooms which are less concerned about being a showcase and simply need to perform while staying within tight budget realities. Command Flex consoles are designed around functionality as it includes all of the elements required for high productivity in a network operations center or control room at much lower cost than a fully enclosed console.